In wartime, presidents are always tempted to expand their authority. But in doing so, they often reach beyond their constitutional mandate. Although the use of military tribunals can be necessary and even effective in times of war, Louis Fisher contends that these courts present a grave danger to open government and the separation of powers. Citing the constitutional provision vesting Congress with the authority to create tribunals, Fisher addresses the threats posed by the dramatic expansion of presidential power in time of war—and the meek efforts of Congress and the judiciary to curb it. 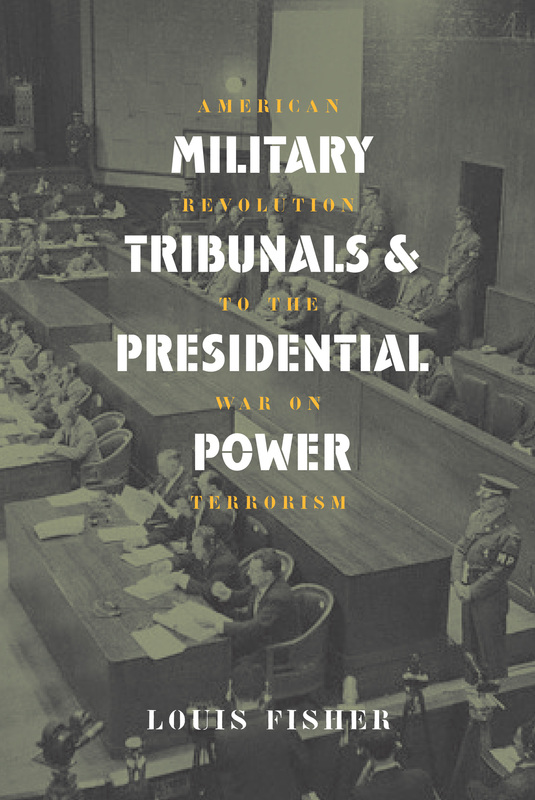 Military Tribunals and Presidential Power is the only book to offer detailed and comprehensive coverage of these extra-legal courts, taking in the sweep of American history from colonial times to today's headlines. Focusing on those periods when the Constitution and civil liberties have been most severely tested by threats to national security, Fisher critiques tribunals called during the presidencies of Washington, Madison, Jackson, Lincoln, Andrew Johnson, Wilson, Franklin Roosevelt, and Truman. He also examines other presidential actions that present military justifications to augment political power, such as suspending the writ of habeas corpus, invoking martial law, and using courts-martial to try U.S. citizens. Fisher also analyzes how the Bush administration relied heavily on precedents set in World War II-notably the Supreme Court's opinion regarding Nazi saboteurs, Ex parte Quirin, a case shown in recent times to have been a rush to judgment. He scrutinizes the much-publicized cases of John Walker Lindh, Yaser Esam Hamdi, Jose Padilla, Zacarias Moussaoui, and the Guantanamo detainees to reveal how the executive branch has gone far beyond the bounds of even Quirin, and he suggests that it is short-sighted to believe that what was only tolerable half a century ago should be accepted as a given today. Fisher's primary concern is to show that the breadth of presidential power in time of war comes at the cost of legislative and judicial control—and that military tribunals represent a concentration of power in the executive branch that the United States would be quick to condemn in other countries. His book cuts to the bone of today's controversies and sounds an alarm for maintaining the checks and balances we value as a nation.